beans are one of the easiest garden vegetables to grow, and they’re a great option for gardening with kids because they grow so fast that it is easy to keep the little ones interested. Another plus to the speed at which they grow is that you can plant them later in the season and still have an impressive harvest no matter where you live. Who can resist fresh corn when it is in season? If you have the desire and a little space, why not grow a few short rows of corn for yourself this year and see just how easy it can be? Fresh sliced cucumbers with a sprinkle of salt are what summer afternoons are all about. Start your cucumbers from seed in the urban garden right now and you’ll be ready for making pickles this fall! Melons are versatile, sweet, and juicy and they are the perfect garden plant to start in June. okra isn’t just for gumbo. The big, beautiful blooms are even edible, so start a few seeds and find out what you’ve been missing! 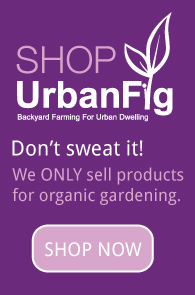 Grab all the seeds you need in the UrbanFig Shop and get out in the garden! I just started some bush beans and cantaloupes the other day! I was wondering if I had hit it too late, good timing on this article! planted some melons the other day, growing like crazy. Think I will add some beans. On arelated note, any one know why my red bell pepper isn’t putting out blossoms? Plenty of leaves, but the green is a bit darker than normal. had some minor insect problems, but those are under control with neem oil. Sounds like — maybe too much nitrogen, not enough potassium? I often bury some chopped-up banana peels under flowering plants that aren’t blooming. Might work for this one, too!